U.S. Navy ocean engineering specialists announced that they had completed preparations to transport USS John S. McCain (DDG 56) to Yokosuka, Japan, for repairs Oct. 11. The specialists, assigned to Naval Sea Systems Command’s Supervisor of Salvage and Diving (SUPSALV), led preparations for ship transport by way of the merchant vessel (MV) Treasure following the destroyer’s at-sea collision Aug. 21. 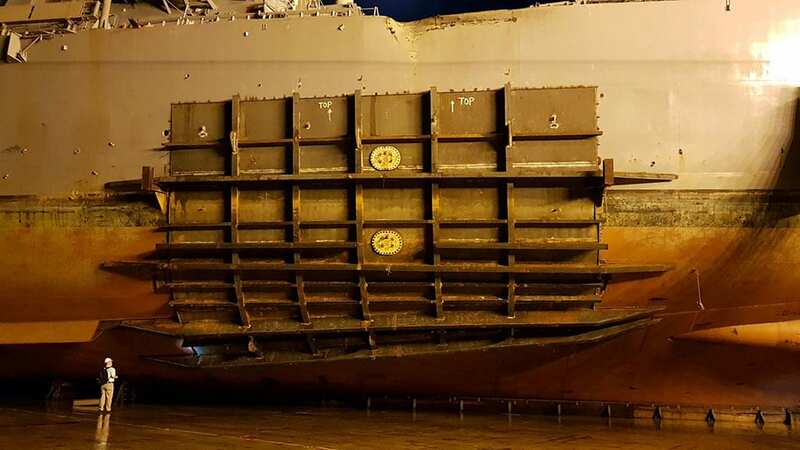 “SUPSALV engineers led the design and installation of a temporary hull patch, developed the heavy lift technical plans/logistics and supervised removal of the ship’s propeller blades by Navy divers before loading USS John S. McCain aboard the transport,” said Capt. Keith W. Lehnhardt, SUPSALV director of ocean engineering. Lehnhardt assigned a team of SUPSALV experts to prepare the ship for transport. An underwater ship husbandry operations specialist reviewed the removal of the ship’s propeller blades prior to loading onboard MV Treasure. Removal of the propeller blades was necessary to load the destroyer on to the flat deck of the heavy lift ship. Also, a heavy lift/towing engineer, a salvage engineer/naval architect, heavy-lift officers from SUPSALV’s naval reserve detachment and a naval architect from the U.K. Ministry of Defence, Salvage and Marine Operations Office led the technical, operational and logistical aspects of the effort. These specialists supervised the development of the complex engineering package and verified proper fabrication and installation of the blocking support structure required to properly load and secure USS John S. McCain aboard MV Treasure. 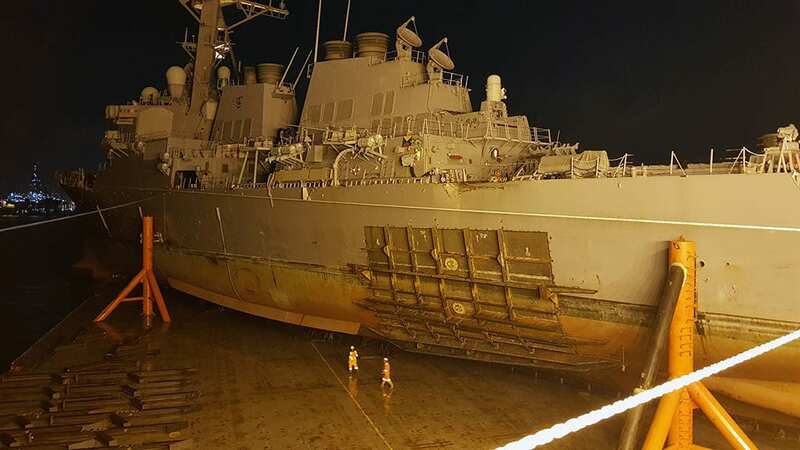 “Once the team verified USS John S. McCain was properly aligned over the blocking on MV Treasure, approximately eight hours were spent de-ballasting the merchant vessel to lift USS John S. McCain out of the water,” added Lehnhardt.